Page Jump: ========== 1 - The screen for the gamer 2 - What's it like to game on? What's it like to game on? 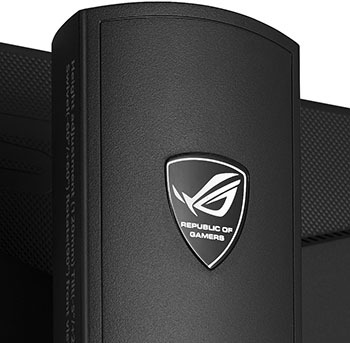 Switching it on reveals that Asus is using a variant of a TN panel. Image quality is neutral and good when looking dead ahead but diminishes, rapidly, when the angle is increased to 45° either vertically or horizontally. There's plenty of forum debate on the merits and detractions of TN, particularly in reference to the usually preferred IPS panels, and we'd rather have seen a different type of screen technology power this monitor, especially at the £649 price point. This, however, isn't readily feasible if you want a high-refresh monitor suitable for gaming: IPS panels aren't good enough to rival the best TN when fast-paced gaming is called for. Starting off the comparisons, we sat the Asus next to a non-G-Sync Philips 272P monitor touting the same screen size and resolution though using AMVA panel technology instead of TN. Calibrating the Swift ROG PG278Q to our liking, which is a just a touch cooler than the shipping Asus parameters, the comparison Philips still produces a cleaner, crisper 2D picture, particularly when viewed from off-centre, and Asus' significantly high refresh rate doesn't really come into play. It can be best described as an average screen for 2D work, though its aesthetics are nicer than the Philips due to that tiny framing bezel. Asus' colour levels are good, with above-average uniformity, but we observed some backlight bleed across the edge of the screen and in the corners. This was noticeable when playing videos in a letterboxed format - black bars at the top and bottom - and it's more prevalent when the brightness is jacked up. Reiterating an earlier point, you need to be looking at the screen head-on for optimum image quality; moving our chair one space to the left or right introduces visual foibles present in TN panels. Yet evaluating a true gaming monitor solely on 2D performance is akin to taking a sports car off road. Put it on the track, or run a few games in our case, shows its true mettle. With our test PC loaded with a GeForce GTX 770 - there's good reason for this, as we'll come to in a moment - and running with the 340.43 drivers on top of Windows 8.1 64-bit, the monitor's resolution and refresh rate is clearly shown in the control panel. 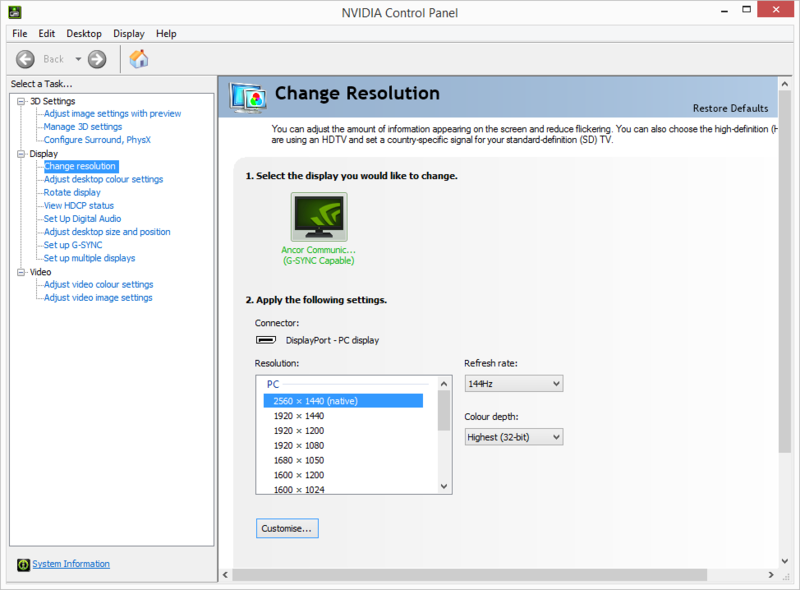 Incidentally, changing the refresh rate via dedicated button on the back of the monitor doesn't translate to them being shown in Nvidia the control panel, even when restarted. 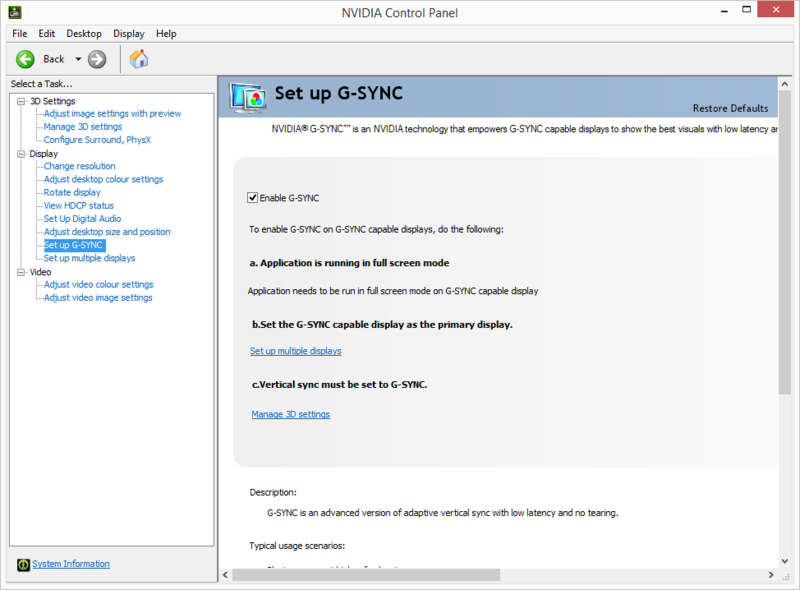 Enabling G-Sync is simply a matter of having that checkbox ticked, which it is by default. There are a couple of obvious caveats; the application must be in full-screen mode and the display needs to be the primary one hooked up to the PC. G-Sync is a seamless technology running in the background. Perhaps the biggest compliment we can pay it is that you don't know it's on - the gaming motion feels natural and right. The reference GeForce GTX 770 2GB card is an ideal candidate for G-Sync at the monitor's native 2,560x1,440 resolution. Let's take BioShock Infinite as an example. The card returns an average framerate of around 50fps at the ultra-quality settings. Frame-to-frame variances mean that over the course of playing the game the effective framerate skips between 30-60fps - harder scenes exact a larger toll while easier ones increase the FPS. With G-Sync matching the monitor's output to the GTX 770's, motion is very smooth and, from what we could tell, free from the tearing and stutter that we've all become accustomed to. It feels as if the framerate is much higher, a perception magnified by the apparent smoothness. It's only by using an overlaid FRAPS framerate counter that you realise it's running at 30-40fps at times. If we had to quantify it, the Asus PG278Q at 40FPS feels like a traditional monitor at 60FPS. Putting it another way, it makes your GeForce appear faster than it really is; a neat trick if you can pull it off. It's only by switching back to a regular screen that the advantages of G-Sync are keenly felt. Going back to the aforementioned Philips and playing through the same sequence certainly isn't as smooth - your eyes tend to focus on the out-of-the-ordinary rendering, usually when it's not quite right or quick enough, so screen tearing and non-smooth motion is detected immediately. That's not to say gaming on the Philips is bad, because it's not, but simply using a metric such as framerate doesn't tell the whole story from a real-word point of view. The GeForce card returns similar framerates in Far Cry 3, Total War: Rome II and a little higher in GRID 2, all set to high/very-high image quality settings. Flitting between 30-75FPS depending upon scene, gaming feels much smoother on the Asus G-Sync-enabled panel. G-Sync benefits begin to diminish as the framerate drops to 30FPS in action-packed sequences (you cannot make 20FPS look entirely smooth in a game) yet the technology is compelling if framerate consistently bounces between, say, 40-60FPS. An example of this lower framerate floor is Crysis 3 set to medium/high settings at 1440p. Framerates routinely drop to 20FPS and rarely rise above 30FPS. G-Sync, in this case, can't offer much of a benefit over a regular screen. The judder is inherent to the GPU's low framerate output, so you need to either lower the quality settings, drop the resolution, or purchase a more powerful card. So what about the 144Hz refresh rate that Asus is keen to draw your attention to? 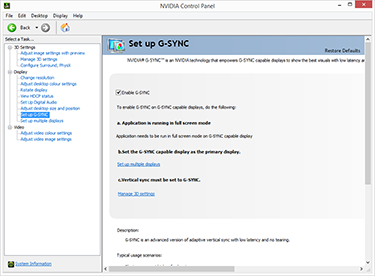 Switching off G-Sync means the screen operates as a standard high-refresh panel. In this scenario, gaming is really only better than standard monitors if you can increase framerate to well over 60FPS, preferably closer to 144Hz, to match the monitor's refresh rate. Spitting out low-latency frames and coupling them to a high-refresh panel has the kind of effect that G-Sync introduces at lower framerates, that is, smooth-looking visuals. But here's the rub; a 144Hz refresh still doesn't map to the graphics output in the same way that G-Sync does, so while it is undoubtedly better if you are able to increase the framerate significantly, there are inevitable visual 'errors' as it oscillates between 70-150FPS. So why have 144Hz and G-Sync on the same monitor, you may ask. We'd describe G-Sync as taking care of smoothness at the crucial 40-60FPS range that a reasonably powerful GPU outputs at a 2,560x1,440 resolution. And if you are able to go much higher by using a GPU, or two, such as the GeForce GTX Titan Black, or are willing to reduce the image quality, 144Hz certainly provides fluid-looking visuals. Remember ULMB earlier in this piece? This technology works in concert with high framerates to provide even crisper images by strobing the backlight. We manually set it to 85Hz in the Asus on-screen control panel and put a GTX Titan Black into the machine. Decreasing quality settings a touch, ULMB, arguably, does reduce motion blur. The effect isn't as clear and obvious as G-Sync, and both technologies cannot be used concurrently - strobing backlight and variable-refresh rates are very hard to match up - but Nvidia may elect to engineer it into future revisions. Low input lag and a fast refresh rate, quoted at 1ms, also help the gaming experience when compared to the Philips monitor. Power consumption peaked at 55W when playing Far Cry 3. Having G-Sync enabled on a 27in, 2,560x1,440-resolution monitor makes a lot of sense for gamers who have a GeForce GTX 770/780-class of video card. These GPUs are able to mete out 40-60FPS in visually demanding titles and thus bring the visually smooth advantages of G-Sync very much into their wheelhouse. Once you see G-Sync in action and compare it against a traditional monitor there really is no going back. Having a maximum 144Hz refresh rate is less important than inclusion of G-Sync tech. 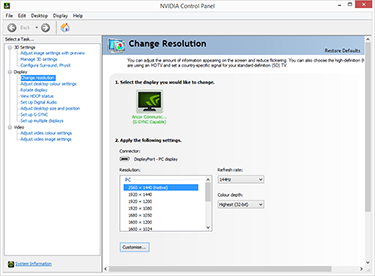 Generally only useful if you can maintain super-high framerates on a consistent basis, which is hard to accomplish on a 1440p screen, we see Nvidia's ULMB feature being more useful in this instance. Reducing motion blur at high refresh rates provides crisper gaming than would otherwise be the case. And the high refresh rate automatically lends itself to 3D Vision usage, if you're still eager to go down that path. We like the Asus PG278Q's native resolution and seamless integration of G-Sync technology. The desire to drive high refreshes means that a TN-type panel is used, but we'd happily trade that for the all-round lusciousness available on a quality IPS panel instead. Viewing angles are poor on even this high-end TN screen - any reasonable angle forces TNs to look underwhelming compared to IPS - and the backlight isn't the best we've seen. The real question we're asking ourselves after a week-long play is whether we prefer gaming on this Asus PG278Q or on a 28in 4K panel that we've just had delivered to the labs. The comparison is apt because both cost north of £500. Pair them with a GeForce GTX 780 Ti enables playable framerates for both screens. 4K certainly looks better from a static viewpoint but the Asus, driven by G-Sync, is so much smoother when the action becomes hot. Asking around the office, we'd happily trade resolution for buttery-smooth gameplay every day of the week. Asus' premise with the Swift PG278Q ROG was to create the best gaming monitor possible. Built with a three-part recipe of G-Sync, high refresh rates (ULMB) and a tasty resolution ideally suited to mid-to-high-end Nvidia GeForce GPUs, it has largely succeeded in its aim. We'd love to see an IPS panel instead of TN, and looking into our crystal ball, a 4K panel with G-Sync really would be the Holy Grail of gaming monitors (Acer has announced one in May), but for now, Asus has the best gaming monitor we've ever seen, though you will have to go down the Nvidia GPU path to realise its potential. The Asus Swift PG278Q ROG G-Sync monitor is available to purchase from Scan Computers. I like the idea of this technology, and while you make good points for having the technology, I fear it may conflict with the type of user who may purchase this. You say that people with a card that crunches in the range of 40-60fps would benefit from this tech the most. However it is a very high end product, reflected in the price, and anyone who would fork out that sort of money for a monitor would also be the type of person who runs high end graphics; they would buy this screen for visual fidelity in gaming above all other scenarios, and it stands to reason that they would also invest in their graphics cards with similar aplomb. I personally run 2 GTX670s, cards that still crank out 60fps with settings maxed at 1200p, even 2 years down the line. They cost £660 but at the time knew it was at least a 3+ year investment (knowing that it would be a higher spec monitor that would be causing me the next upgrade, something I'd never previously thought, until now graphics could always get beefier, was a great time to be aliiiive! But I digress). How does this monitor compare to another monitor at 60fps ? If it's not much of an improvement, dropping that sort of cash now might not seem such a good idea, as I could have a 4k screen, or go in a different direction and upgrade my TV for gaming (some games just suit 50" over fidelity). Also, upgrading to 4k means having to upgrade cards; I'd rather pour acid in my eyes than play a game with less than maximum settings (note to self: don't test that theory), so if it came down to it I think I'd rather have a bigger screen and know I'm keeping to 60fps. Of course I don't expect this to be a shared opinion; from people I've spoke to, there is such a division when it comes to the idea of monitor vs TV gaming. I'd echo that sentiment. Although I'd still like a 4K IPS monitor with G-Sync, even if it were just limited to 60Hz, G-Sync can take the pain away from below 60fps framerates, and I can always drop the resolution down to 2K in game to keep the framerates from dropping below 30fps. Only TN runs at 144Hz. Admittedly 144Hz isn't quite as necessary with G-Sync, but Asus were making the ultimate high refresh, low latency gaming monitor, not a workstation-grade colour-perfect monitor, which can't keep up with TN performance. So ruling out TN out-of-hand is silly. lol, same here ! £649 almost stopped me reading - for a gaming monitor that seems a tad high, i'd think that is more in a professional price range but they wouldn't bother with TN the Pro's.